52 | TH E M R EP O RT O R I G I NAT I O N S E R V I C I N G DATA G O V E R N M E N T S E C O N DA R Y M A R K E T THE LATEST ORIGINATION Understanding Financing Options for Manufactured Housing Cash is popular in manufactured housing purchases, and when it comes to financing, chattel or personal property loans are common. R estrictive zoning and expensive financing are holding back the production of more manufactured homes. According to a recent study by the Urban Institute, helping people understand their financing options for manufactured housing could increase the demand for these homes as a viable affordable-housing option. In a report that looks at demystifying this segment of the housing market, researchers at the Urban Institute looked at how financing for manufactured housing (MH) differed from that for traditional housing units or properties. It found four key differences. First, the market was served by a small group of specialized lenders; second, the average loan size for manufactured homes was small; third, refinancing was rare and was usually done by general lenders; and fourth, cash was the most preferred means of a transaction for manufac- tured homes, especially for used units. 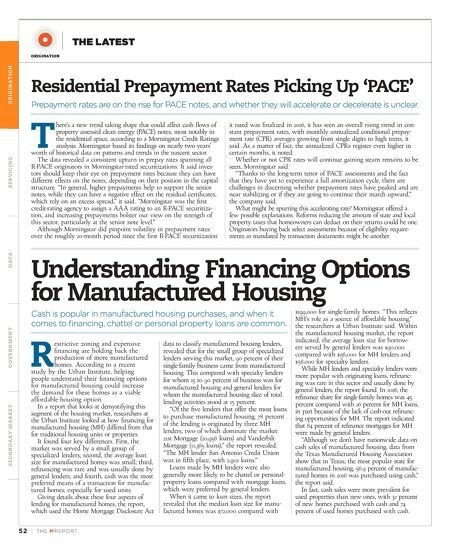 Giving details about these four aspects of lending for manufactured homes, the report, which used the Home Mortgage Disclosure Act data to classify manufactured housing lenders, revealed that for the small group of specialized lenders serving this market, 90 percent of their single-family business came from manufactured housing. This compared with specialty lenders for whom 15 to 90 percent of business was for manufactured housing and general lenders for whom the manufactured housing slice of total lending activities stood at 15 percent. "Of the five lenders that offer the most loans to purchase manufactured housing, 78 percent of the lending is originated by three MH lenders, two of which dominate the market: 21st Mortgage (20,956 loans) and Vanderbilt Mortgage (11,365 loans)," the report revealed. "The MH lender San Antonio Credit Union was in fifth place, with 2,902 loans." Loans made by MH lenders were also generally more likely to be chattel or personal- property loans compared with mortgage loans, which were preferred by general lenders. When it came to loan sizes, the report revealed that the median loan size for manu- factured homes was $72,000 compared with $199,000 for single-family homes. "This reflects MH's role as a source of affordable housing," the researchers at Urban Institute said. Within the manufactured housing market, the report indicated, the average loan size for borrow- ers served by general lenders was $90,000 compared with $56,000 for MH lenders and $58,000 for specialty lenders. 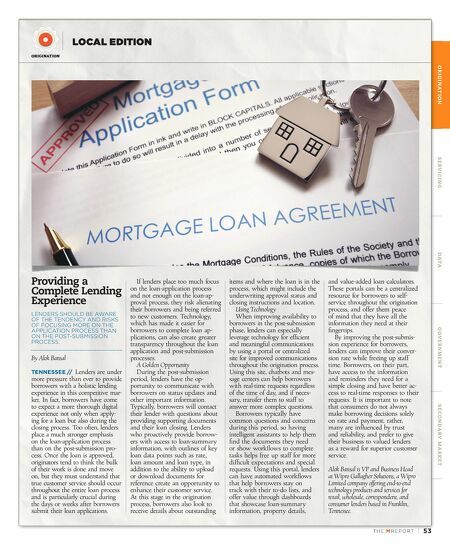 While MH lenders and specialty lenders were more popular with originating loans, refinanc- ing was rare in this sector and usually done by general lenders, the report found. In 2016, the refinance share for single-family homes was 45 percent compared with 26 percent for MH loans, in part because of the lack of cash-out refinanc- ing opportunities for MH. The report indicated that 84 percent of refinance mortgages for MH were made by general lenders. "Although we don't have nationwide data on cash sales of manufactured housing, data from the Texas Manufactured Housing Association show that in Texas, the most popular state for manufactured housing, 56.9 percent of manufac- tured homes in 2016 was purchased using cash," the report said. In fact, cash sales were more prevalent for used properties than new ones, with 32 percent of new homes purchased with cash and 74 percent of used homes purchased with cash. Residential Prepayment Rates Picking Up 'PACE' Prepayment rates are on the rise for PACE notes, and whether they will accelerate or decelerate is unclear. T here's a new trend taking shape that could affect cash flows of property assessed clean energy (PACE) notes, most notably in the residential space, according to a Morningstar Credit Ratings analysis. Morningstar based its findings on nearly two years' worth of historical data on patterns and trends in the nascent sector. The data revealed a consistent upturn in prepay rates spanning all R-PACE originators in Morningstar-rated securitizations. It said inves- tors should keep their eye on prepayment rates because they can have different effects on the notes, depending on their position in the capital structure. "In general, higher prepayments help to support the senior notes, while they can have a negative effect on the residual certificates, which rely on an excess spread," it said. "Morningstar was the first credit-rating agency to assign a AAA rating to an R-PACE securitiza- tion, and increasing prepayments bolster our view on the strength of this sector, particularly at the senior note level." Although Morningstar did pinpoint volatility in prepayment rates over the roughly 20-month period since the first R-PACE securitization it rated was finalized in 2016, it has seen an overall rising trend in con- stant prepayment rates, with monthly annualized conditional prepay- ment rate (CPR) averages growing from single digits to high teens, it said. As a matter of fact, the annualized CPRs register even higher in certain months, it noted. Whether or not CPR rates will continue gaining steam remains to be seen, Morningstar said. "Thanks to the long-term tenor of PACE assessments and the fact that they have yet to experience a full amortization cycle, there are challenges in discerning whether prepayment rates have peaked and are near stabilizing or if they are going to continue their march upward," the company said. What might be spurring this accelerating rate? Morningstar offered a few possible explanations. Reforms reducing the amount of state and local property taxes that homeowners can deduct on their returns could be one. Originators buying back select assessments because of eligibility require- ments as mandated by transaction documents might be another.